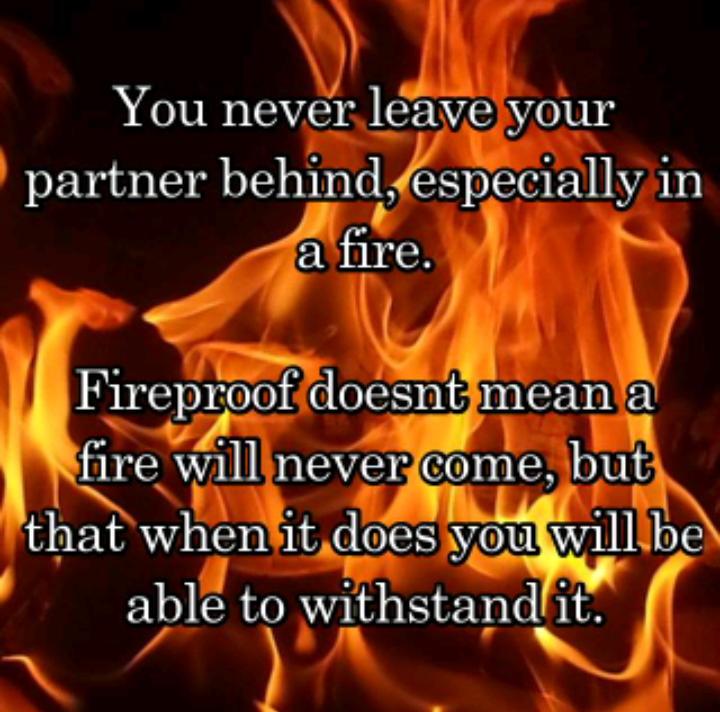 If you haven’t seen the movie, Fire Proof, i strongly encourage you to watch it. The first time i heard of it i didn’t want to see it. I figured it was going to be some boring movie about a firefighter and that was about it. My mom had us all watch it and i have loved it ever since. The first time watching it my husband slightly made fun of it. This was the time frame that we were not connected, we were like two different people living on two different planets. After the time had come and gone of the mess involving J, see my story story of the sexual assault and manipulation of J here, our lives had started improving. The connection we never had was now there and we watched the movie together, this time it had a whole new meaning and so much felt personal to us. At one point in life this is how i strongly felt, i just wanted out. Again, due to J’s constant nagging on my brain this was all i was starting to think about. I was waiting for my husband to be unfaithful, use drugs, or be violent, and that would be the last time i would deal with it. Biblicly i was waiting for him, the unbeliever, to leave cause the scripture says if an unbeliever leaves you are free from them, but the believer is not to leave cause the believer makes the spouse sanctified. 1 Corinthians 12 To the rest I say this (I, not the Lord): If any brother has a wife who is not a believer and she is willing to live with him, he must not divorce her. 13 And if a woman has a husband who is not a believer and he is willing to live with her, she must not divorce him. 14 For the unbelieving husband has been sanctified through his wife, and the unbelieving wife has been sanctified through her believing husband. Otherwise your children would be unclean, but as it is, they are holy. I was sure if i pushed him hard enpugh he would admit that he didn’t love me and was only staying because we had children. For many years all we did was fight. Our home was more like a war zone, but instead of weapons of bombs and guns it was loud screaming, sarcasm, and insults. I pushed and pushed, but he wouldn’t admit to not wanting to be married. In the past he did, but at that point i didn’t have someone pushing me to leave my husband using the manipulating tactic of “God doesn’t want you with him.” Me trying to get him to admit he wanted to leave sent him into a fight for our marriage, total oppisite of what i thought he would do. It was more of the moment in fire proof where he gave her the beautiful roses and she gave him divorce papers. The guy falling down, totally broken was what i felt my husband doing inside. Shortly before we got to this point in life my husband was actually starting to try to do things better, not a whole lot, but there were small things here and there. I was like the woman in fire proof, i was so angry and had no trust in him whatsoever anymore, so i didn’t see it or believe he could be changing for real this time. One day he kept texting me while i was out, asking if i was almost home. I thought it was strange the way he kept asking. He knew i love the song “Earned It” by the weaknd. I came in the front door, he was dressed in a suit, the song playing, and rose peddles on the floor, if i remember correctly. He got down on his one knee saying how sorry he was for the past and how he wants to make it up to me. He asked to spend the rest of our lives together. I wish i could remember everything he said, and the way he said it, but i remember enough to know that i was living the story of the girl from my favorite movie, fire proof.